I’m a great believer in recycling, so if you have a cardboard box (or a cardboard circle from under a pizza) that you can reuse as a wreath form, that’s great! I already had a styrofoam ring for this project, but I frequently make wreaths using a cardboard base, as well as Recycled Shrimp Ring Christmas Wreaths. See Glitter Leaf Wreath for more details on making a cardboard ring base for your wreath. Attach one end of the feather boa to your wreath base, using a straight pin or floral pin on styrofoam, or scotch tape for cardboard. Begin wrapping the boa around the circle. You’ll should use about 15 inches of boa to wrap around each quarter of the circle. Add pins or tape as needed to keep the boa evenly distributed and securely attached. Attach the garland to the top of the wreath, just as you did with the boa. The garland will likely be shorter than the boa, so won’t be able to wrap it around the circle as often. Keep the wrapping evenly distributed and fairly loose so that you don’t crush too many feathers. I didn’t need to use any pins or tape for the garland except at the beginning and the end. 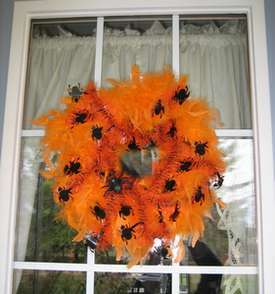 If either the feather boa or the garland has a loop on one end, you can use that to hang your wreath. If not, simply attach a loop of ribbon at the top of the wreath and hang where desired.